Vehicle tracking systems have revolutionised the way many businesses manage their employees and resources. From providing satellite navigation to keeping fuel costs down, these systems can help improve company efficiency and keep both customers and employees safe and happy. The wide range of functionalities of vehicle tracking systems offer many benefits for fleet owners, but this means that they are likely to be well beyond the price range that small businesses can afford. If this is true for your business, don’t despair, because there are some alternative options out there for you to try. There is already a growing number of vehicle tracking apps for smartphones out there. While most vehicle tracking apps for iPhones and Android phones are just mobile extensions of full-scale systems, dig a little deeper and you’ll be able to unearth a few stand-alone apps that you can start using straight away. Downloadability: Was it easy to download the app? How long did it take to load when you opened it? Instructions: Are the instructions easy to follow? Interface: Is the interface easy to follow and visually clear? Usefulness: What functions does this app offer, and which one(s) is/are most useful for you? Responsiveness: Is the app quick to respond to your input? Battery Life: How long did your phone battery last when you had the app open? Effect on Other Apps: Are your other phone apps affected by this app when you have them open at the same time? Yes or No? : Would you recommend this app to your friends? iTrack Lite is the entry-level edition of the iTrack suite of apps. It performs a basic function—to keep track of people in your network. This is useful if your goal is to keep tabs on your employees’ whereabouts and find out when they’ve reached their destinations. Downloadability: Very quick. It only took a few seconds to download on an iPhone 5. Instructions: When you load the app for the first time, it prompts you to open an account through your email address or your Facebook account. An interactive tutorial then pops up, which is easy to navigate. Interface: The interface is fairly intuitive. There are buttons at the top of the screen to help you get started. You can ‘follow’ people, refresh your screen and click on the help page through these buttons. Usefulness: This app is really just for keeping track of your staff. If you need to do surveillance on someone for some reason, this app will monitor their location for up to 72 hours. You can start tracking someone by ‘following’ them, either by sending them an email or inviting them through Facebook. Unfortunately, the instructions that come with the invitation aren’t very clear, but once the ambiguities are cleared up, the actual setup itself is quick and painless. The tracking itself is a bit hit-and-miss. According to the app, two testers were 500 metres away, although both of them were in the same building. This could be problematic if you’re tracking an employee who’s making deliveries and you need to make sure that they’re getting to the right locations. Responsiveness: This app was very responsive—no frozen screens at all. Battery Life: Surprisingly, this app wasn’t a battery drainer. You can set the frequency at which it will transmit your subject’s location, ranging from every 10 minutes to every hour. Our tester’s phone charge lasted a whole day with this app running in the background. Effect on Other Apps: The app ran quietly in the background, and didn’t cause any problems on how the other phone apps ran. YES or NO? : Our testers are on the fence on this one—A definite YES for the fact that it’s free and intuitive to use, but NO for the inaccurate location pins. This is the full version of iTrack. With this one, you can follow up to 100 people and get a history of their journeys in the last 3 days, including their average speed and direction. Downloadability: Similar to its lite version, iTrack was quick and easy to download. Instructions: As soon as you open iTrack for the first time, it will ask you to create an account either through your email or your Facebook account, even if you already have an account with the lite version. Like the lite version, this version has an interactive tutorial. Interface: The screen for the full version is the same as that for the lite one. There are only a few buttons at the top of the screen to help you get started. Usefulness: The functionalities of the full version are pretty much the same as those of the lite version. It is a step only in terms of capacity. The good thing about using this app is that the people you want to track don’t have to have the full version. They can download the free version and still join your network. The app has a very good map with a street-view option. Unfortunately, our testers had the same issues with pin accuracy as with the lite version. They also noticed that if a person they’re tracking stops using their phone for some time, the app stops transmitting their location. The only way to re-activate the transmission is to contact the other person and ask them to re-open the app, which defeats the purpose of using GPS tracking. Responsiveness: The app was very responsive. Battery Life: As with the lite version, you can set the frequency at which the app will transmit your subject’s location, ranging from every 10 minutes to every hour. Our user’s phone charge lasted a whole day with this app running in the background. YES or NO? : NO, unless you need to track 100 people – our test team suggests sticking to the free version of the app. Tracker365, designed by a Chinese developer, was made exclusively for iPhones and iPads. Downloadability: Download was quick and easy. However, our tester didn’t realise that there are two components to this app that had to be downloaded separately—the main app itself and the manager, which is where you can view the data for the vehicles/people you’re tracking. Instructions: The instructions are a direct translation from the original Chinese text, which means you’ll have to read some of them more than once to understand what they’re saying. There are no tutorials either, so if you’re the impatient type of app user, you might find yourself starting get a little bit frustrating. Interface: The interface for the app is fairly intuitive. The default screen is the trip log, which shows the user’s current location, direction and speed, among other things. There’s a prominent record button at the top of the screen that you can press if you want your journey to be logged into the server. Usefulness: Our user really liked this app once they came to grips with its functions. On the menu is an emergency contacts section. You can choose to phone, text, or email your emergency contact, or even use Facebook and Twitter with just one click. You can only assign one contact per mode though, so you’ll have to think hard which of your emergency contacts are best to get in touch with by phone, email or text. You can choose from Apple Maps or Google Maps when viewing journeys. Every journey that’s recorded is uploaded to the cloud and you can query your database by date. 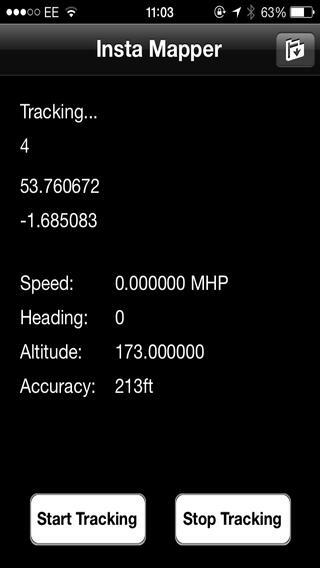 You can also view the trip log on your phone. If you have a network of people to keep track of, you can use the Manager app to view everyone’s recorded journeys, including their average speed and altitude. In terms of accuracy, the app was spot on in detecting location. The only downside the user can think of for this app is that you have to download the app for every device that you want to track, which can be quite expensive if you have a high number of people to keep track of. Responsiveness: The main app itself is very responsive, but the Manager app can be slow at times. Battery life: Because you’re running 2 apps at the same time, using this app can have a negative effect on your phone’s battery life. Our user found that keeping it open cut their phone battery life by half. Effect on Other Apps: The app wasn’t intrusive and didn’t affect the user’s other open apps. YES or NO? YES, if you’re using it to keep track of just a few people. Mycartracks is one of the more comprehensive vehicle tracking apps available for smartphones these days. It offers 4 different packages, ranging from the free version of the app to the professional fleet package. Downloadability: The app was quick and easy to download. Instructions: Our tester found the instructions to be easy to follow. Interface: The interface was visually clear and intuitive to navigate. Usefulness: Our user got the free version of the app, the obvious choice as all the other packages require a monthly subscription. You can press the record button and register your journey as either personal or business. Once the record button is on, you can forget about the app as it automatically detects motion and stops. The free app can track up to 3 vehicles and keep a travel log dating back to 2 weeks. You can also set up geofences for fleet management and job dispatches for your employees with this app, and print out 5 monthly reports. All the data are saved and downloaded from the cloud so they don’t take up space on your phone. Responsiveness: The app was very responsive and posed no issues at all to our user. Battery Life: Because the app is designed to detect motion and stops, it doesn’t use up a lot of charge. Effect on Other Apps: Our user didn’t notice any issues that affected the other apps on their phone. YES or NO: Definitely a YES from our test team. Followmee is one of the more popular tracking apps available right now. The Android app comes in 3 versions—free, standard and deluxe, with increasing functionalities. One of our testers downloaded a trial version of the deluxe version. Downloadability: The app was downloaded without any hitches. Instructions: Our user found it easy to start using the app from the get-go as the instructions were clear. Interface: The interface is visually clear. When you open the app for the first time, it will ask you to register for an account. You can use this same account to register other devices for this service. Once this is set up, you can start tracking your devices straight away. The deluxe version can keep up to 90 days’ worth of logged journeys. You can do real-time monitoring on the Followmee website, as well as download reports in various formats. Followmee also allows geofencing, even on the free version. One unique feature of Followmee that’s available in all its versions is the stealth mode. You can switch the app on without it showing up on your phone screen. This allows you to monitor your devices without being detected. It’s especially useful for checking in employees who might be doing unauthorised journeys or for tracking down stolen vehicles and other possessions. Responsiveness: The app is quick to respond, and our user didn’t encounter any problems at all when using it. Battery Life: Followmee prides itself on its low battery consumption. Sure enough, the deluxe version didn’t use up a lot of charge when our user tested it. Effect on Other Apps: This app ran quietly in the background, and didn’t affect the user’s other apps that were in use. YES or NO: Despite the cost, our tester would still recommend Followmee – YES! Instamapper is another free GPS tracking service that can be downloaded as an app. It offers a number of unique features that you won’t find in other apps. Downloadability: Instamapper downloaded to our tester’s phone without any issues. Instructions: The instructions on the screen are easy to follow. You’ll need to register on the Instamapper website first, which will give you a device ID. Once you key this ID into your phone app, you’re good to go. Interface: The interface is clean and easy to navigate. Our user was able to use this app straight away, without any hitches. Usefulness: Instamapper is terrific for real-time tracking, as you can set it to transmit locations at 5-second intervals for more accurate tracking. You can view the devices you’re tracking on the Instamapper website, and add new devices as you go along. You can also let other people track you by sending them an email or Facebook message via the website. This app has 2 unique features that we like. Firstly the auto boot, which allows the app to start automatically once the device is switched on. This means that even if the person you’re tracking forgets to switch Instamapper on, you’ll still be able to track them anyway. The other feature we like is the text activation. You can start or stop the app by sending a text message to the phone, which is again perfect for when the person you’re tracking is forgetful. Route overviews can be downloaded in various formats too. API integration is possible, which means you can actually integrate the app into your own business system, such as allowing your customers to get ETAs on their deliveries. The Instamapper app can be upgraded to the Pro version, which has an annual subscription fee. The Pro version offers stealth mode, which adds another dimension of security to your devices. The stealth mode allows your app to be undetected on your phone, and you can also activate the app by dialing a secret number. Plus, you can add a password to the app. Responsiveness: The app was highly responsive, according to our tester. Battery Life: Setting the app to transmit locations at 5-second intervals can be a killer, as this uses up a lot of charge. However, you can always compromise by adjusting the intervals to as high as an hour. Effect on Other Apps: Instamapper didn’t have any effects on other apps on our user’s phone. YES or NO: This was a definite YES for our user. Smartphone vehicle tracking apps are still in their early stages of development, but as you can see, most of them are very promising. While they might not be able to replace full, web-based vehicle tracking services yet, they can definitely be useful to small start-ups. Besides our list of cheap vehicle tracking systems in the UK, these apps are definitely worth exploring as a short-term alternative as most of them are free to download. Otherwise you can get free vehicle tracking quotes accordingly to your business needs by completing our short form.